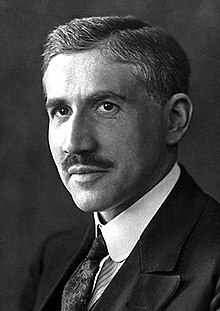 Otto Fritz Meyerhof (April 12, 1884 – October 6, 1951) was a German physician and biochemist who won the Nobel Prize in Physiology and Medicine in 1922. Otto Fritz Meyerhof was born in Hannover, at Theaterplatz 16A (now:Rathenaustrasse 16A), the son of wealthy Jewish parents. In 1888, his family moved to Berlin, where Otto spent most of his childhood, and where he started his study of medicine. He continued these studies in Strasbourg and Heidelberg, from which he graduated in 1909, with a work titled "Contributions to the Psychological Theory of Mental Illness". In Heidelberg, he met Hedwig Schallenberg. They married in 1914 and became parents of a daughter, Bettina, and two sons, Gottfried (who referred, after emigration, to himself as Geoffrey) as well as Walter. In 1912, Otto Meyerhof moved to the University of Kiel, where he received a professorship in 1918. In 1922, he was awarded the Nobel Prize in Medicine, with Archibald Vivian Hill, for his work on muscle metabolism, including glycolysis. In 1929 he became one of the directors of the Kaiser Wilhelm Institute for Medical Research, a position he held until 1938. Escaping the Nazi regime, he emigrated to Paris in 1938. He then moved to the United States in 1940, where he was appointed a guest professorship at the University of Pennsylvania in Philadelphia. In recognition of his contributions to the study of glycolysis, the common series of reactions for the pathway in Eukaryotes is known as the Embden–Meyerhof–Parnas Pathway. Meyerhof died in Philadelphia at the age of 67. ^ Raju, T. N. (1998). "Archibald Vivian Hill". Lancet. 352 (9137): 1396. doi:10.1016/S0140-6736(05)60805-7. PMID 9802314. ^ Peters, R. A. (1954). "Otto Meyerhof. 1884-1951". Obituary Notices of Fellows of the Royal Society. 9: 174–178. doi:10.1098/rsbm.1954.0013. JSTOR 769206. ^ Anon (1951). "Obituary: Otto Fritz Meyerhof". The Lancet. 258 (6687): 790–792. doi:10.1016/S0140-6736(51)91682-0. PMID 14874513. ^ "The Nobel Prize in Physiology or Medicine 1922". Nobel Prize. Retrieved 2011-01-11. Otto Fritz Meyerhof was born on April 12, 1884, in Hannover. He was the son of Felix Meyerhof, a merchant of that city and his wife Bettina May. Soon after his birth his family moved to Berlin, where he went to the Wilhelms Gymnasium (classical secondary school). Leaving school at the age of 14, he was attacked, at the age of 16, by kidney trouble and had to spend a long time in bed. During this period of enforced inactivity he was much influenced by his mother's constant companionship. He read much, wrote poetry, and went through a period of much artistic and mental development. After he had matriculated, he studied medicine at Freiburg, Berlin, Strasbourg, and Heidelberg. ^ "Uni Kiel – Otto Fritz Meyerhof". Uni-kiel.de. Retrieved 2017-06-26. ^ Kresge, N.; Simoni, R. D.; Hill, R. L. (2005). "Otto Fritz Meyerhof and the elucidation of the glycolytic pathway". The Journal of Biological Chemistry. 280 (4): e3. PMID 15665335. ^ Barnett JA (Apr 2003). "A history of research on yeasts 5: the fermentation pathway". Yeast. 20 (6): 509–43. doi:10.1002/yea.986. PMID 12722184. This page was last edited on 5 February 2019, at 15:46 (UTC).